Close to 42,000 Americans will be diagnosed with oral or pharyngeal cancer this year. It will cause over 8,000 deaths, killing roughly 1 person per hour, 24 hours per day. Of those 42,000 newly diagnosed individuals, only slightly more than half will be alive in 5 years. (Approximately 57%) This is a number which has not significantly improved in decades. The death rate is higher than that of cancers which we hear about routinely such as cervical cancer, Hodgkin’s lymphoma, laryngeal cancer, cancer of the testes, and endocrine system cancers such as thyroid, or skin cancer (malignant melanoma). Oral cancers are part of a group of commonly referred to as head and neck cancers, and of all head and neck cancers they comprise about 85% of that category. VELscope Vx provides the most powerful technology available for assisting in the discovery of oral mucosal abnormalities. VELscope Vx plays a key role in the early discovery of such abnormalities, which can be critically important in the fight against oral cancer. 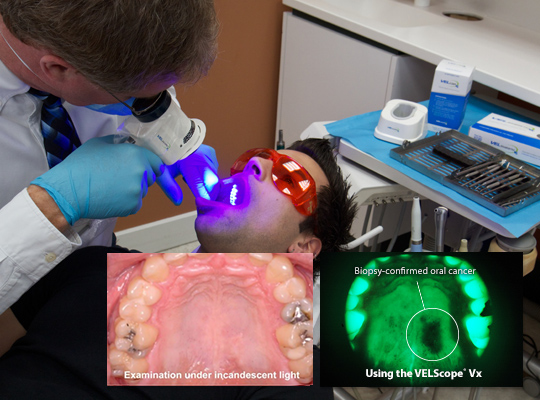 When used as an adjunctive aid in combination with traditional oral cancer examination procedures, VELscope facilitates the early discovery and visualization of mucosal abnormalities, including oral cancer. In one or two minutes, with no rinses or stains required, a VELscope system examination helps healthcare professionals assess their patients’ overall oral health.